Hi! How are you all doing today? It snowed here this morning but quickly turned to rain. I hear we are going to have temps in the 60s in a couple of days, and for January, that is so unusual! Perhaps I am in the minority, but I enjoy winter and a change of seasons. Give me the cold, give me some snow! I paired some pretty papers from DCWV's Garden Party mini stack with an old flower that I found in my Christmas decorations. I took out the center and replaced it with a shiny green rhinestone brad. The lace is more of that almost-20-year-old stash I recently used, so I am entering this card at Shopping Our Stash once again (oldest ribbon challenge). After unearthing the lace in the basement, where it languished with all of my sewing supplies, I'm really happy to give it new life. Many, MANY thanks for the awesome comments you've left for me lately. I'm so uplifted by all of you! So lovely, Colleen! Love that lace! This card is delicate and beautiful. Your heart shows with the sentiment. Gorgeous card Colleen! I know she will love it and it will cheer her up! Well I'm sure it will lift your friend's spirits, it lifted mine! Your lace trim REALLY makes this card. It's the perfect accent to the papers and your pretty bloom. Wonderful Colleen, very pretty card! its an absolutely beautiful card colleen.. It's sure to lift anyones spirits..the lace is gorgeous. The papers, the flower, lace and sentiment..all go along so well together. This is gorgeous! LOVING that lace and the pearls!!! Thanks for playing along with us at Shopping Our Stash! So many beautiful elements Col! This would life anyone's spirits and your friend will appreciate your heartfelt love and thoughtfulness you put into this! Your trim is gorgeous and could it really be that old? :-) New life you sure gave it and an appreciated one it will be! I hope you are doing well. You have been in my thoughts. Pretty card. I really like the lace and pretty pretty flower on the bow. This should help to put a smile on your friend's face. So Beautiful Colleen! Love the papers and the colors and that Fab lace! Perfect to brighten up anyone's spirits! How fun to have "found" this gorgeous lace :) Made for a great card! Wow, this is so beautiful, I love it! The design of this card is just so soft and sweet, and the heart-warming sentiment is awesome! It will be such a blessing to your friend, and I pray that God will bless YOU for being a blessing to your friend, and to us in sharing your wonderful art. I'm so grateful for your participation, and hope to see you again soon. This is a lovely, heartfelt creation and I know your friend will appreciate it. I have that sentiment set and I find it very useful. What a beautiful card Colleen ..I am sure your friend will appreciate it a lot :) ...I loved the papers and the trim you have used so gorgeous!!! Its so pleasant and pretty ! I loved the pp, beautiful rose , lace n pearls .all of them make a gorgeous card. du hast wieder so eine herrliche, elegante Karte gestaltet. Wunderschön die zarten und feinen Farben. Oh Colleen your friend will be so happy to get this beauty! I love how you used the DCWV Garden Party papers. I don't know how you do it but you always have such beautiful lace. Love it dear! We've had over a week at extremely cold temps - down to -39C with the windchill. Today it's -16C, and tomorrow? +8. That's just not right. Rain in the winter is just icky & gross. I'm with you! Your card is gorgeous - I love the tiny bit of cheery red peeking out from the cream/white tones! It's just the sweetest card for you friend, Colleen. That brad looks so pretty in the center of your flower and the lace is yummy. We'll be 70 degrees or a bit more today. Of course, storms on the way. Ugh! Hi, Colleen! What a beautiful way to give new life to your old lace and flower. This card is just beautiful! And no one scatters pearls perfectly crossed a design like YOU! This is so soft and pretty! Love it!! I'm sure this beauty will do the trick, Col. You're such a thoughtful friend. Your card is so pretty. I love wonderful colors of paper you used and the lace and flower is the perfect touch..
Love the sweet delicate background, mix of papers, and beautiful lace, Colleen! Such a pretty card...love it! 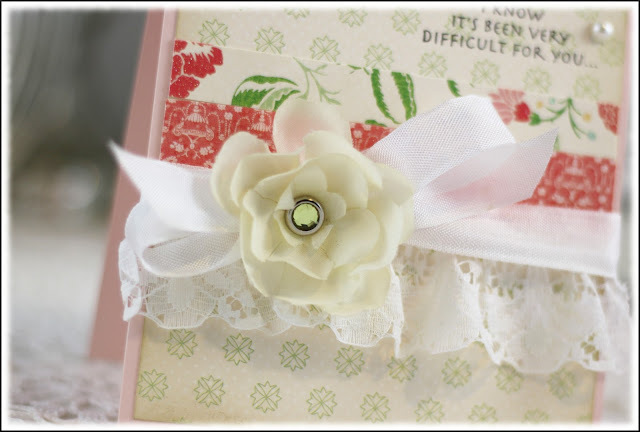 This is so sweet with the pretty lace and flower and I love how you've scattered the pearls! We were at 70° today and supposed to be tomorrow too. While it's nice to get outside and enjoy some fresh air, I'm still hoping for some Winter weather! Hi! Thanks for stopping by my blog today and leaving a sweet comment. This card is so pretty and feminine. Hope your friend feels better soon. This is such a beautiful card and I'm sure your friend will be uplifted by it. Great to find a use for old stash - I should try that again. Your friend is blessed to have such a thoughtful friend as you, to make and give this lovely card. I'm sure it meant a lot to her. How sweet this is. Such pretty papers and love the gorgeous lace. You are so privileged when you a receive a card like this. Sending this to a friend who is going through a dififcult time is a lovely way to show her you care for her. Gorgeous Colleen! Wonderful card! I really liked the sentiment you used. The colors are so soft and soothing. A nice way of saying you are there for your friend. You have a great stash of lace! Thanks for sharing this with us.